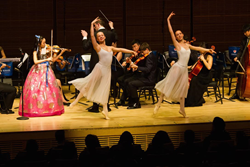 The Dwight Schools, dedicated to educating innovative global leaders, brought together 220 students from New York, Los Angeles, London, Seoul, and Shanghai to perform in a cross-campus collaborative concert at Carnegie Hall. This program exemplifies Dwight's pioneering efforts since 1972 to break ground in international education and prepare students to thrive in today’s globalized world. With campuses in New York, London, Seoul, Shanghai, and on Vancouver Island, The Dwight Schools are leading International Baccalaureate (IB) World Schools providing students with invaluable opportunities to participate in cross-campus cultural and curricular collaborations, and exchange programs. Dwight offers these same opportunities to students around the world who take courses online or in a blended learning environment through Dwight’s Open World School, including students in the ICL Academy for Film and Performing Arts in Los Angeles, who joined their peers to perform at Carnegie Hall. “No matter where in the world a Dwight student lives, we personalize the educational journey for each one based on individual passions, which we call ‘igniting the spark of genius in every child.’ We are equally committed to preparing students to be global leaders who can solve global challenges in innovative ways,” said Stephen Spahn, Chancellor of The Dwight Schools, the longest-serving head of school in New York City. Elli Choi ’20, who began violin studies at age three and only a year later was invited to the Suzuki Method World Convention. A soloist at age five, and student in the Pre-College Division of The Julliard School by age seven, she is a seasoned performer with world-renowned youth and professional orchestras; and winner of numerous honors, including first prize in the Senior Division of the 2015 Lipinski and Wieniawski International Competition for Young Violinists in Poland; the Grand Prize at the 11th Young Virtuoso competition in Sofia, Bulgaria in 2015; and is invited to the Menuhin Competition 2016 in London. To see a video of Dwight global students preparing for Carnegie Hall, click here. Founded in 1872, Dwight School is a leading international school located on Manhattan’s Upper West Side. It is the first school in the Americas to offer all four IB programs for students from preschool through grade 12. A Dwight world-class education rests on three pillars: personalized learning, community, and global vision. Graduates attend such leading colleges and universities worldwide as Harvard, Yale, Princeton, MIT, Stanford, NYU, Brown, Columbia, Oxford, and the University of Edinburgh.